Four additional NanoLumens® Nixel Series™ LED displays will help keep the airport’s 20 million annual travelers up-to-date on flight times, news, weather, tourism opportunities and more. NanoLumens®, the award-winning creators of uniquely compelling interactive LED visualization solutions, today announced that Honolulu’s Daniel K. Inouye International Airport has expanded its leading digital infrastructure with the addition of four large-scale NanoLumens Nixel Series™ LED displays. Oklahoma City-based Ford AV installed a total of six NanoLumens displays at the airport with the first two displays installed in 2015. Ford AV has been working with NanoLumens for several years, forging a successful partnership that is built on NanoLumens’ ability to custom design LED visualization solutions in any size, shape, curvature and pixel pitch that are also thin, lightweight, environmentally friendly and easier to service than other displays. The 6mm pixel pitch, 2,000-nit NanoLumens Nixel Series displays feature feeds from SITA-manufactured software running on Dell Optiplex XE2 computers, which generate the flight information, in addition to a BrightSign XT1143 solid state media player that outputs destination city weather, text ticker and advertising videos. 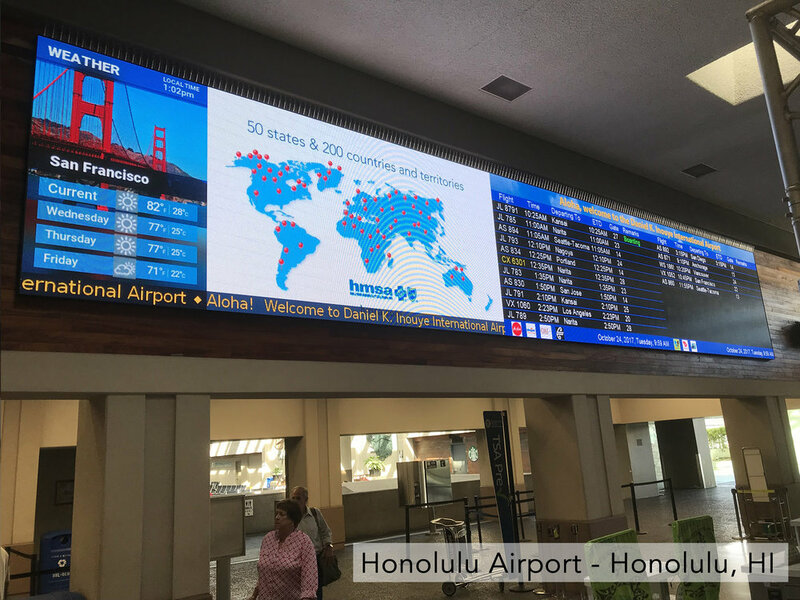 The Daniel K. Inouye International Airport joins a growing list of airports that have turned to NanoLumens for cutting-edge LED visualization solutions that better engage with and inform busy travelers. Other airports include the Darwin International Airport in Australia, the Stansted and Heathrow airports in England, The Sao Paulo Airport in Brazil, the Changi Airport in Singapore, the Vancouver, Toronto Pearson and Montreal Pierre Elliott Trudeau International Airports in Canada and JFK International, Atlanta-Hartsfield, Miami, Detroit and Cincinnati International Airports in the United States. Newer PostStampede’s 2017 Big Book of AV Tour Heads West to San Diego on November 16th!